With the search and rescue efforts officially called off in Haiti, the time has come for reconstruction. But with nearly 200,000 dead and one in nine Haitians currently homeless, it's easy to get caught up in the numbers and lose sight of the primary lesson learned from the catastrophe. That poverty kills. And it kills big time. Stop for a moment and imagine an earthquake of similar magnitude in San Fransisco. It's highly unlikely that we'd see a similar death count -- not with San Fran's first-world infrastructure and emergency response network, not to mention the support from surrounding areas. But we don't have to imagine these things. Back in 1995 the Great Hanshin Earthquake rocked the Kobe area in Japan killing 6,434 people. 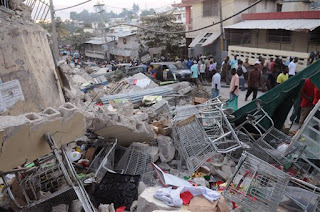 This earthquake hit 6.8 on the Richter scale and struck a heavily populated area -- very comparable to Haiti. And in 2008 the Sichuan Earthquake killed nearly 68,000 people in China, a country that sits firmly between the third and first worlds. There's obviously a direct correlation with the relative affluence of a community and their ability to cope with disaster. There's no question that the the death toll in Haiti was severely accentuated by the poor state of affairs in that country. It's all fine and well that the world's attention is now focused on Haiti, but the damage has already been done, an outcome caused directly by the earthquake and indirectly by years of global neglect and indifference. As Mahatma Gandhi once said, "Poverty is the worst form of violence." Indeed, this is exactly the kind of unintended violence we impose upon the impoverished peoples of world when they're largely forgotten. Moreover, the violence that's unleashed by poverty is hardly limited to the impacts of natural disasters. As Peter Singer recently noted, "Every year, more people die from poverty related causes than entire population of Haiti." It's clear that poverty has to be eliminated, and Haiti offers a remarkable opportunity to take a de facto post-apocalyptic society and set them on the right track. Success in this matter could provide an unprecedented blue print for similar reconstruction efforts around the world. All the money that's pouring in has to be routed to the right areas. While aid agencies are doing an exemplary job dealing with the initial humanitarian crisis, they are far too chaotic, uncoordinated and decentralized to rebuild the country. Rebuilding efforts will have to be conducted by dedicated transnational institutions working in tandem with private industry. Haiti's infrastructure will have to be rebuilt from scratch. This will include roads, ports, housing, electricity, sanitation and water. The entire Haitian country has to be redesigned for resilience in anticipation of another earthquake. The development of viable economic opportunities is paramount, particularly ones that are sustainable. Agriculture would be a good start; Haiti has some of the sweetest mangos on the planet. Looking further ahead, however, the country's infrastructure needs to be brought to first world standards if it hopes to compete and do business with the rest of the world. All this is easier said than done, I know. And quite obviously the reconstruction effort will be more complicated than my four bullet points. But we have to start somewhere and something has to be done. As Bono of U2 once said, "We're not looking for charity, we're looking for justice." I think you're wrong about poverty - certainly poverty is bad, but it does not represent active 'violence'. Poverty is the most common state of nature - it is only with a particular set of policies and institutions (and lower population growth than economic growth thank to birth control) that incomes can rise. We should ask not 'who is perpetrating this violence' but 'what have some places done in recent history that got rid of poverty'. I think your suggestions on ending poverty in Haiti are pretty useless - yes infrastructure is nice, yes coordination is good, yes more productivity is good. We in the west have a pretty terrible record of trying to get these things to happen in other countries and there is little reason to think we will succeed here in a country with no institutions to build from. Many people would not see it that way. They would think of it more like "poverty does nothing, but wealth reduces the casualty level." It all depends on what you consider to be a neutral state. This is not merely a matter of semantics: If poverty kills, then protection from the worst ravages of the world is a right in a compassionate society, whereas if safety is a side benefit of wealth, then such protections are a privilege rather than a right. Just another reason why the 'rights' discourse is nonsense on stilts. Become a consequentionalist and you don't have to worry about that nonsense. On the other hand, if safety is not a right but a privilege of wealth, the we really ought to ban police departments and let everyone hire their own private security, for example. Criminals are a natural hazard of any urban environment, are they not? Whatever should or shouldn't be done, I don't think the American government should get involved with the problems of foreign lands anymore. It tends to end with the rightfully elected leaders being forcefully replaced by pro-multinational-megacorp dictators, which just makes things worse for the people they're supposed to be "saving". I am amazed by some of the comments here. We of all people should be aware of the possibilities of technology to eradicate poverty as well as its causes. I would recommend looking at thevenusproject.com and the works of Jacque Fresco, which talk about this topic in great detail. Thanks for the great post, George. Thanks for the supportive comment, Stuart. I'm also dismayed by some of the comments here. Why amazed? My argument isn't that countries can't or shouldn't develop - it's that outsiders have a terrible track record of trying to intervene to save countries where things are going horribly wrong. We should work to end poverty of course, but use methods that are likely to work. Immigration is the only solution with a good track record. I'd like to see us investigate charter cities as well.